You’ll transform from a passive consumer to an active creator, and escape the “Mediocre Majority” of people who endlessly consume without ever producing. The content you produce will become an asset that you own. It will work for you 24/7, and become a magnet for like-minded people, interesting ideas, and career opportunities. 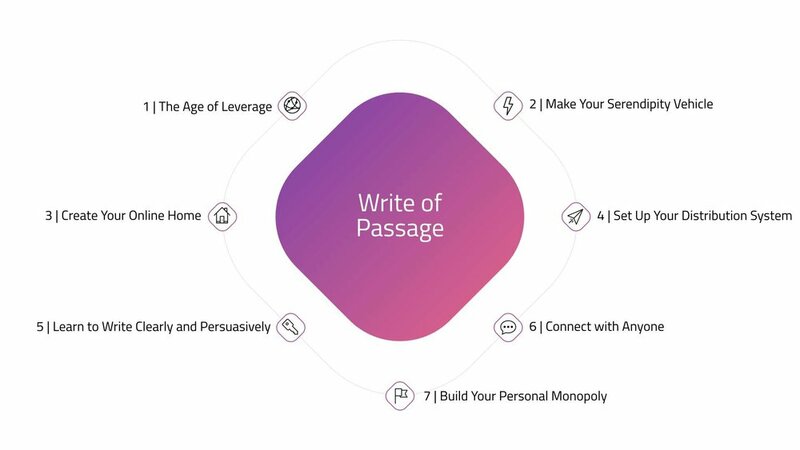 It doesn’t matter whether you are writing internally at your company, building an online business, or networking among industry peers – Write of Passage will give you with the tools to reach, educate, and connect with your target audience. Writing effectively will be your competitive advantage. In school we learned an outdated, ineffective method of writing. We were taught to follow an arbitrary set of requirements. Our teachers told us to pad our writing to reach a minimum length, and to use flowery vocabulary completely foreign to our everyday lives. I am going to help you unlearn all of that, and adopt a results-focused approach to writing. Build a following that brings you personal and professional opportunities. Your followers will help you find excellent opportunities, including jobs, projects, clients, and sales. Create intellectual assets that grow in value over time. Your writing will grow into a body of work with a coherent purpose, not just a series of one-off posts. Connect directly with peers, colleagues, and leaders in your industry. I’ll show you how to use your writing as an introduction to the most interesting people in your industry. Boost your influence in your field, organization or industry. I’ll show you how to build a reputation as the top authority in your field using evergreen content. Increase the serendipity and opportunity in your life. Create a life of more surprise, potential, and excitement by harnessing the full potential of the internet. 7 Modules: Live video and slide-based lectures packed with David’s best insights, examples, and recommendations. 10 Deliverables: Writing assignments designed to level up your writing skills and publish more than you ever have before. 12 Templates: Specially formatted to help you immediately apply each new lesson and technique to your career or business. Live Interaction: Learn alongside a cohort of peers from around the world as you give each other feedback and share ideas. Guest Interviews (Premium version only): Curated, actionable case studies with well-known content creators explaining their approaches. Enter your email to learn about Write of Passage. I’ll respect your privacy and won’t send you spam. Soon, you’ll receive a series of emails about Write of Passage. You might also enjoy my weekly newsletter called Monday Musings. It’s the easiest way to receive the latest updates on articles, podcasts, and the online course. Check out the website to learn more about the course beforehand. There, you’ll be able to watch a video of the first module. If you’re ready to enroll now, click here. I look forward to speaking with you soon. Thanks again! Module 1: The Age of Leverage. The rules of the game have changed. The internet now impacts every nook and cranny of the economy. I’ll tell you what this means for you personally and show you how to turn it from a threat into an immense opportunity. Module 2: Make Your Serendipity Vehicle. I’ll give you a new way of thinking about writing, as a “Serendipity Vehicle” that brings a wealth of opportunities into your life. I’ll share my 7 Principles of content creation to help you build a consistent habit of collecting, distilling, and sharing your best ideas. Then, I’ll address four common misconceptions that keep people spinning in circles, not knowing where to start. Module 3: Create Your Online Home. We’ll talk about your website, which is your face and your reputation to the world. I’ll give you a clear, step-by-step pathway for making a simple, yet effective professional website so anyone looking for your expertise can find you. Instead of managing technical roadblocks, and getting sucked into the endless spiral of designing and redesigning your website, we’ll focus only on the essentials. Module 4: Set Up Your Distribution System. You’ll set up an email newsletter, a direct communication channel to your audience. You’ll learn to spread ideas in an efficient and repeatable manner that doesn’t take too much time. This distribution system will give you a way to test and improve your ideas even faster, by tapping into the wisdom of crowds. Module 5: Learn to Write Clearly and Persuasively. You’ll work with your course-mates to develop a writing style that is both unique to you, and that also follows best practices I’ve learned from years of trial and error. The quality of your writing and your thinking will improve in tandem as you adopt a higher standard of rigor. You’ll put these new skills to use immediately. You’ll write 5 articles on your blog, send a “personal update” to colleagues and friends, and write an in-depth “long-form” article to demonstrate your expertise. Module 6: Connect with Anyone. You’ll put your writing assets to use. To reach out and connect with interesting people who you wouldn't meet otherwise. Instead of asking to “pick your brain” or “grabbing coffee or a drink” with no particular purpose in mind, you’ll be able to send out your writing ahead of you to prove your credibility and provide context to your conversation. This powerful new take on networking will revolutionize your ability to connect with the people who can make the biggest impact on your career. Module 7: Build Your Personal Monopoly. You’ll clarify your vision and create a “personal monopoly” – the unique intersection of your knowledge and skills that no one else can compete with. Instead of working ever harder and ever longer, and battling against fierce competitors you’ll carve out a niche where your ideas reign supreme. Because no one can ever replace you at the center of your network, you’ll be able to share everything you learn without fear, knowing that whatever value is created will eventually flow back to you. You’ll develop a fresh approach to writing. I chose the name Write of Passage because this shift isn’t a linear one. It’s not a slight improvement on your writing abilities nor a single step up in your career. It’s a complete before-and-after transformation of the trajectory of your career and your life. Instead of watching the game from the sidelines, you’ll influence the game itself. Instead of choosing from a bland menu of options that life offers you, you’ll author your own path forward, so you can get what you want out of life. Enter your email to learn more about Write of Passage. It’s not about becoming an “Internet entrepreneur” – it’s about how to succeed professionally in the 21st century. The Internet is now an essential part of every kind of business and career. Right now is the perfect time to start publishing, because there’s huge demand for high quality content. It’s not about having a checklist to follow – it’s about a different way of thinking and communicating online. The Internet is no longer a thing we use for certain functions. It is a place where everyone learns and plays and works, and it’s time to learn how to use it effectively. It’s not about reaching a final destination – it’s about a learning journey. Publishing your writing online isn’t just about "getting somewhere." It’s about maximizing the return on your efforts and accelerating your speed of learning every step along the way. It’s not about an easy shortcut – it is about getting started on a clear path. There are no shortcuts to success – online or offline – but with a trend as huge as the rise of the Internet, just participating allows you to ride the wave. It’s not about becoming a literary genius – it’s about gaining a practical skill to help you reach your goals. Writing doesn’t have to be a mysterious craft reserved for the select few. It can be a practical, fun activity that has benefits far beyond the words on the page. It’s not about isolating yourself for countless hours – it’s about using writing as a bridge to other people. Writing is not just an activity, but a way of seeing things. It’s about living a richer, more fulfilling life and attracting the people you want to share it with. It’s not about working 24/7. It’s about working smarter, building a network, and gaining leverage. Publishing your writing online gives you access to three of the most powerful forces in the world today: knowledge, networks, and technology. The more you leverage them, the more successful you’ll be. It’s not about “networking” to collect random business cards – it’s about truly connecting with like-minded people. Relationships are now just as likely to start online, and later move offline. By casting a wide net online you can find that small tribe of people who are just as passionate about your niche as you are.